The smugglers of sacrificial animal rawhides are facing an unfavourable situation this time due to strong vigilance by law enforcers at different strategic border points as well as the downtrend in rawhide prices on the international market, said tanners. Official sources said police and Border Guard Bangladesh (BGB) have already taken strong measures to check the possible smuggling of rawhides of sacrificial animals through different border points. Another discouraging point for the smugglers is the falling prices of rawhides on the international market, including the neighbouring countries. "Rawhide prices have declined by US$ 20-25 cent per square foot on the international market. So, we think, smugglers are unlikely to smuggle out rawhide taking the challenge of strong vigilance during this Eid-ul Azha as there is profit prospect," said General Secretary of Bangladesh Tanners' Association (BTA) Shakhawat Ullah. He claimed that the price of rawhides of A-D grades was 1.70 US dollars per square foot which now came down to some 1.50 US dollars, while that of animal skins of other grades declined to one and less than one US dollar. Tanners sat in meetings with the Home Minister in July last and the Dhaka Metropolitan Police Commissioner this week (Aug 13) to discuss the collection of rawhides and checking their smuggling. "At the meetings, law enforcement agencies, particularly the BGB, assured all of taking all-out measures to prevent the rawhide smuggling," Shakhawat told UNB. Noting that no rawhide is smuggled out through Cumilla border, he suggested stronger vigilance of law enforcers at the country's western border points, including that of Satkhira, Benapole in Jashore and Hilli in Dinajpur. Mentioning that the country's tanneries collect 60 percent of their annual rawhides during Eid-ul Azha, Shakhawat said they estimated that they can procure 70-80 lakh rawhides of sacrificial animals this time. Of these, he said, 45-50 lakh will be of cowhides, 15-20 lakh of goat, five lakh of buffalo and five lakh of sheep. On August 9 last, the government fixed the prices of sacrificial animal rawhides reducing that from the rates of the previous year. 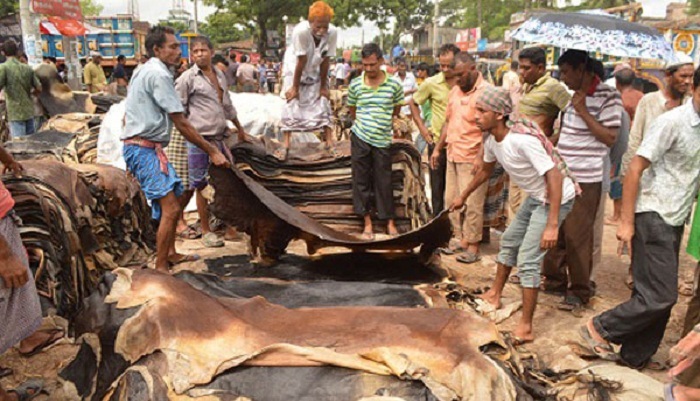 The government has fixed raw cowhide prices at Tk 40-45 per square foot for the capital while at Tk 35-40 for outside Dhaka during this Eid-ul Azha, which were down from Tk 50-55 and Tk 40-45 respectively in the last year. Besides, the prices of goatskins have been fixed at Tk 18-20 per square foot for all over the country while that of she-goat at Tk 13-15. According to BTA statistics, a total of 108 tanneries are now in operation at Savar Tannery Estate after being relocated in 2017 from the capital's Hazaribagh area which was the houses for 222 tannery industrial units. Five-seven more tanneries may go into operation within the next few days before the Eid. Assistant Inspector General (AIG-Media) of Police Headquarters Md Sohel Rana said the Inspector General of Police (IGP) has already instructed all the police units, including Dhaka Metropolitan Police (DMP) and district ones, to take all-out steps for preventing the possible rawhide smuggling. As per the instruction, the DMP will take strict measures so that no vehicle carrying rawhides of sacrificial animals can go outside Dhaka district for several days after the Eid-ul-Azha. The IGP ordered the police in frontier districts to work maintaining coordination with BGB to prevent the smuggling of rawhides, said the AIG (Media). He said BGB has been asked to remain alert to prevent any attempt of rawhide smuggling out to India after the Eid day. "We've already reinforced BGB in frontier areas to prevent the possible smuggling of rawhides during the Eid," said BGB Jashore region Commander Brig Gen Md Khaled Al Mamun. He said BGB has beefed up its patrol and vigilance at border points so that drugs cannot enter the country as their demand goes up during the Eid. The strong vigilance will continue to prevent the rawhide smuggling, too, he added. Nearly 20 border points have been as most vulnerable to smuggling. Those are Benapole in Jashore, Burimari in Lalmonirhat, Akhaura in Brahmmanbaria, Sona Masjid in Chapainnawabganj, Hili in Dinajpur, Tetulia in Panchagarh, Teknaf in Cox's Bazar, Birol in Dinajpur, Satkhira, Nalitabari in Sherpur, Gowinghat in Sylhet, Damurhuda in Chuadanga, Feni, Haluaghat in Mymensingh, and Bhurungamari in Kurigram.